Hehehe no posts for ages then 2 in one day, this is for the Stampotique challenge, I seriously love their punky funky stamps. The words on here came from a sheet of scrapbook paper and it says Be You its the very best thing you can be. This is lovely, such a fab sentiment too and you wouldn't argue with Gooseneck telling you!! Very pretty, gorgeous vintage card. 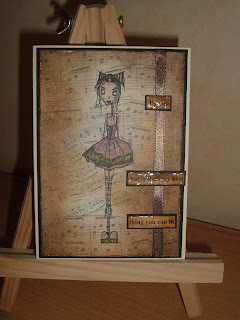 Thanks for joining us at Stampotique Designer's Challenge. Oh wow this is wonderful. What a beautiful vintage piece! Thanks for joining us at SDC # 16. I love the background! Lovely vintage card! Thanks for joining us at SDC!